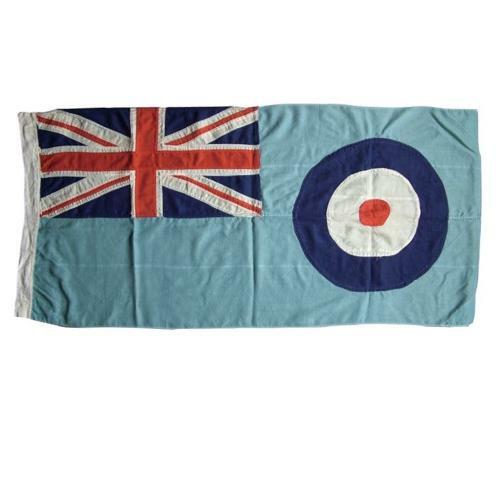 Royal Air Force station ensign (flag). Woven cotton mix, approximately 59 x 135cm (23 x 53"). Both the union flag and roundel are made up from individually stitched panels rather than being printed. Lacks rope and toggle. Excellent condition. Unmarked. The vendor told us that this was removed from RAF Thorney Island but we cannot corroborate this. That airfield was built in 1938 for fighter aircraft and was involved in the Battle of Britain when attacked by the Luftwaffe on the same day as other stations such as RAF Ford & RAF Poling radar station. Later it was transferred to Coastal Command and finally closed in the mid 1970s. Stock code M23149.